The Centre for Brain Research is committed to world-class research on the brain, in health and disease. From basic biomedical sciences to clinical research, our Centre is a multidisciplinary partnership between scientists, clinicians and our community. Our unique model of neuroscience investigation was purposely developed to foster research collaboration and, 70+ teams and approximately 400 researchers come from several schools across our University. We have identified three key areas where we can make a difference. These include a Brain Recovery Clinic, a Biobank and Integrative Neuroscience Facilities, which are outlined in our strategic plan. Find out about the types of research carried out at the centre and contact the scientific team leaders. Find out about forthcoming research openings in the centre. Emerging neuroscientists in the CBR organise a full calendar of research and social events. Every day at the CBR our researchers are working hard to find and develop new treatments for brain disease. 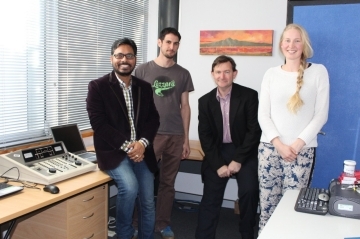 View our new Centre of Research Excellence (CoRE) co-hosted with the University of Otago.